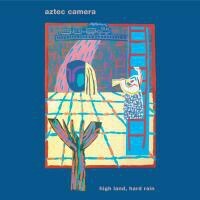 Upon the re-release of his band's seminal debut album High Land, Hard Rain, the Aztec Camera frontman talks about that album's legacy and his iconoclastic approach to music. For some, early success breeds resentment later in life. Those looking to make a living in music don’t necessarily want to be told that they reached the peak of their artistic prowess right at the start of their career. That sort of thing doesn’t seem to bother Roddy Frame, though. The man behind Aztec Camera has had a long, storied career that is still going strong -- Frame has been recording a new album in the studio owned by Orange Juice’s Edwyn Collins. However, most people reading this will probably remember frame for one album: Aztec Camera’s debut, High Land, Hard Rain. The album, which has been re-issued through Domino Records, was recorded and released when Frame was only nineteen. Now 50, the Scottish songwriter looks back on the album as one of his career’s benchmarks. “I think it’s helped me,” Frame says of the album’s popularity and legacy. “I don’t think it’s hindered me at all.” Frame and I spoke further about the album’s legacy, as well as the idiosyncratic nature of his work as a whole. When this album came out, the Postcard scene was in full swing, but what you were doing was very different than anything going on in Glasgow or anywhere else at the time. Was that a deliberate move on your part to do something so different? I guess what you’re referring to is that sort of folky, acoustic guitar element. I mean, I love guitars. I really love to play, so I was really into that. There were gasps and sighs when I played these gigs in Glasgow and I pulled out a 12-string. People hadn’t seen those for a while, and here was this 16-year-old kid playing one. I think that was a different element, and I’d like to think that we convinced a few bands that came after us to use acoustic guitars and explore that stuff. I know you’ve mentioned Django Reinhardt and a few other artists as inspirations for High Land, Hard Rain, but what else was inspiring you as you were writing those songs? Just prior to the Postcard scene, I was really into the scene that was happening in Liverpool at the time: bands like Echo and the Bunnymen, the Teardrop Explodes. That was a big influence. The attitude, more than anything else; the psychedelic, slightly obscure thing that was happening lyrically with those bands. At the time of High Land, Hard Rain, I was listening to a lot of American stuff, like Neil Young, Bob Dylan, Buffalo Springfield, Love... all that kind of stuff. I remember listening to a lot of Neil Young while driving at night after recording in the studio. You started learning guitar at a young age. Yeah, I started learning guitar when I was about four years old. I was playing the thing when I was around nine or ten. Would you attribute that to your advanced proficiency on the guitar by the time you started recording? Well, a lot of guys who were in bands at the time picked up the guitar because of punk, and musicianship was sort of frowned upon then. If you picked up a guitar in 1977 and went beyond three chords, it was seen as slightly distasteful. By then, I’d been playing along with records by Mick Ronson and Wilko Johnson by the time I was 13, so the guitar was my thing. I was never going to do anything else. I was just completely crazy about it by the time I was four or five years old. Were you into punk at the time? Oh yeah. I completely loved it. It was a big turning point for me. It was very reassuring because I had been into the glam thing -- Roxy Music, David Bowie, and all that -- and glam seemed quite otherworldly and very superstar-ish, which is kind of what attracted me to it in the first place. But when punk came along, it said, “Anyone can do it. You can form a band.” So we did. That seems to be the universal takeaway from punk, that anyone can do anything. Yeah, exactly! It was liberating. On the reissue of the album, there are a few remixes of “Walk Out to Winter” and “Oblivious” that have more of an electronic bent. Were you considering taking your music in that direction at the time, or was that not something you were interested in doing? I’ve always found synthesizers fascinating. Because I grew up on Roxy Music and Brian Eno, I’ve never considered that someone with an acoustic guitar and a plaid shirt is somehow more authentic than someone with a synthesizer or a drum machine. I think all music has the power to inspire, and I don’t really care how people get to that point or what tools they use. When I saw the Fairlight for the first time and we started using it for the remake of “Walk Out to Winter,” I was very excited by it, although the heavy metal band next door spat on it. [laughs] He actually walked past it and spat on it! But yeah, I was always open to using new things like that. Sometimes, though, I think that was a marketing disaster. Now, we recognize things like brand recognition, so I think it would’ve been better from a commercial point of view if I had just worn a plaid shirt and strummed an acoustic guitar! [laughs] But when you’re young, you want to experiment and try all sorts of things. To be honest, I think half of those remakes work and half of them don’t. The “Walk Out to Winter” one is great, I think they really captured something good. It’s when they’re approached with a pop sensibility. When it’s remixed just to get it on the dance floor, I don’t think you did Aztec Camera much good. Would you say, though, that the album had an effect on how Knife was received at the time? I think it’s an underrated album, but it’s very different from what you had done before. I think that anyone in marketing at the time would have said that [making Knife] was suicide [laughs]. But I do think you have to follow your heart, and before I made Knife, I spent a lot of time in New Orleans. I was living in a big house and listening to Infidels by Bob Dylan every day, and I saw that Mark Knopfler produced this record, so I thought, “Well, I’ve got to check him out.” Then, I started writing these songs that I thought he could work with. The other thing behind that was that I really wanted to get out of that “indie” ghetto. You know, that NME thing where only a few bands that sound the same get talked about. I just find it so conservative that there was this small scene and everyone toed the line to keep them happy. Plus, you know I was young and rebellious, so I couldn’t bear the idea of being some sort of pet for someone at the NME. I really saw Knife as one in the eye to that sort of “indie” mentality, especially after I spent a lot of time in the States. The music scene in America was much more wide open, much more about doing whatever you wanted, as opposed to someone telling you that only three bands matter. As you career progressed, did you find yourself moving towards a more conventional way of writing songs? Something like “Somewhere in My Heart” seems like an example of this. That’s a good question. I’m not sure. All I can remember was that when I was recording “Somewhere in My Heart", we were in Boston. I was walking around with a Walkman playing Bruce Springsteen all the time. But it was all of his poppy stuff. I got into Springsteen back to front; I started with Born in the USA and Tunnel of Love and worked backward. I still like that period better than the Born to Run stuff, but I guess I was just trying to come up with something like “Hungry Heart” or something. Just something really strong and catchy. When it came out, this album established you as an artist. As you kept going on in your career, did you ever view High Land, Hard Rain as something that you had to fight against, as far as your image went? Not really. Not consciously, anyway. As far as I can remember, I think it was the other way around. I think the record company sometimes wanted to build on that sound, but I was young and I wanted to do things like go to America and make a sort of Jimmy Jam & Terry Lewis record or make an album with Ryiuchi Sakamoto. Looking back now as an old guy, I’m actually very proud of High Land, Hard Rain. I think it’s such a lovely little self-contained world that reflects where I was at the time.